We are trying to get back into raising rabbits. 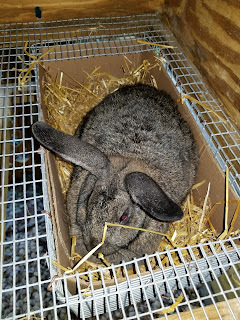 With all that was going on throughout this last year, we had only bred for one kindle about a year ago, so we have not really been raising rabbits...just feeding them. Not breeding broke down our cost effectiveness for having them. You see, we feed rabbits and then we buy less meat for ourselves and for our dog and cats. Our grocery and animal feed costs have risen so we are looking forward to getting them back down again. Then we had another issue to overcome. Of our original three New Zealand White rabbits, two does and one buck, we had one doe who probably should have been put down months ago. She has recently been laid to rest because she was in pain and would have passed in a day or two. We started with the three NZWs, but later added two Silver Foxes, a black with the blue gene buck and a blue doe. When we bred them together we usually got average of half of them being black and half being blue. We still have the blue doe although this will be her last year for breeding most likely and we had to put down the buck because of teeth and eating issues. I have been trying to find a black buck with blue to replace him, but the breeder we had gotten them from is not breeding them anymore. Silver Foxes are more rare and it looks like we are going to have to take a trip to get some. Since they are so rare and I like them so much more, my husband and I are considering raising Silver Foxes solely. They have smaller kindles with usually six to eight compared to the NZW which have had up to thirteen, but we lose less and the SF does are excellent mothers. The offspring do take about three to four weeks longer to go to full size for culling, but their coats and temperament are worth the bit of extra expense. Plus we could probably sell more as breeders, since they are difficult to find for those of us who are looking. WS is a New Zealand White who was sexed wrong and put in with her brothers so she ended up pregnant, hence the name. Of all our NZWs she has been the gentlest so we decided to keep her as a breeder. 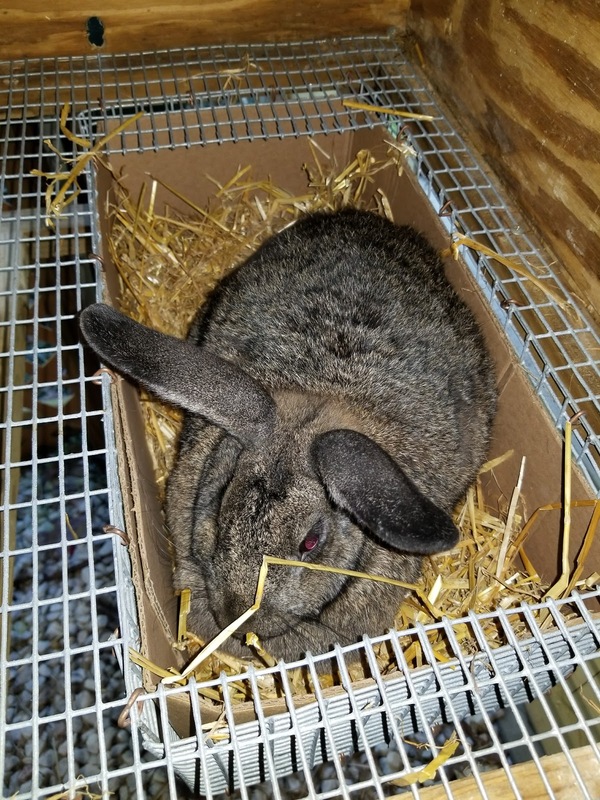 The oldest and largest of our rabbits is MB, a Blue Silver Fox. She is also our biggest eater! I think this will be her last year of breeding which is why I am trying desperately to find a SF buck. She is a very good mother. I have never lost any of her kits. For weeks during this summer we had no bucks. As I wrote, our NZW died of old age and the SF could not eat due to teeth issues, so we had to put him down. I found a NZW breeder who was selling off his stock to move. We planned to buy one buck, but he offered three for the price of one, so we got the three, two are brothers and the other a distant cousin, but we plan to only keep one of them as we begin to replace all the NZW with Silver Foxes. These bucks were a little young, but we tried a breeding with the rowdy distant cousin and GG. GG was due yesterday and it looks like she is not pregnant, although I have had the does fool me before. Rabbits really do not show their pregnancies. Palpation can be done at two weeks half way through a pregnancy, but I have yet to master that. In fact, I have rarely felt the babies until the week of the due date and even then if there are many and they are small, I still cannot tell with certainty. So, if I see nothing in the nest for the next two days we will try breeding her with the same buck to see if he can reproduce. My Lord, please bless us with some Silver Fox rabbits, which have been so difficult for us to find, and may all our rabbits be healthy.